Sometimes food happens without much forethought or planning. I could have pondered it for weeks, in fact I’ve been wanting to make these for years, but when I bought mackerel fillets at the market last week I had no plan; a quick weeknight dinner at best. Rillettes were far from my thoughts, lurking behind the distant corner of a hazy summer memory. 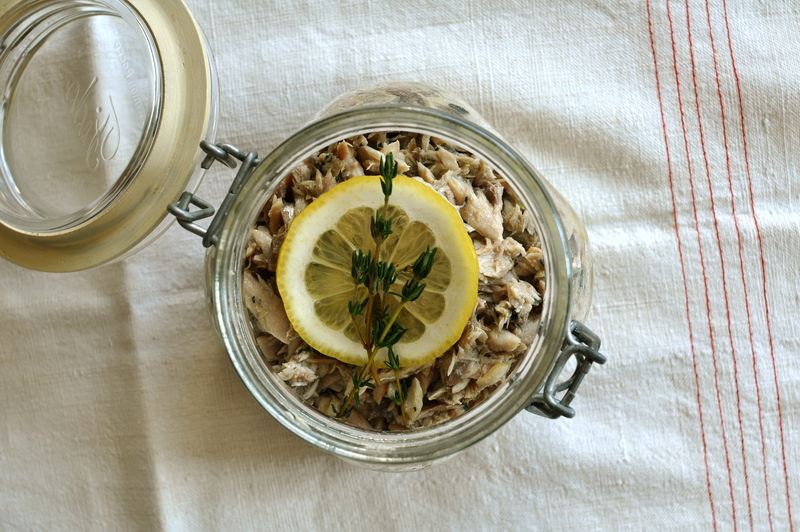 But as I contemplated dinner for friends and something that could easily be made ahead, I found myself searching for mackerel rillettes recipes. So this is adapted from one by Annie Bell, modified to suit what I had on hand. It was delicious. 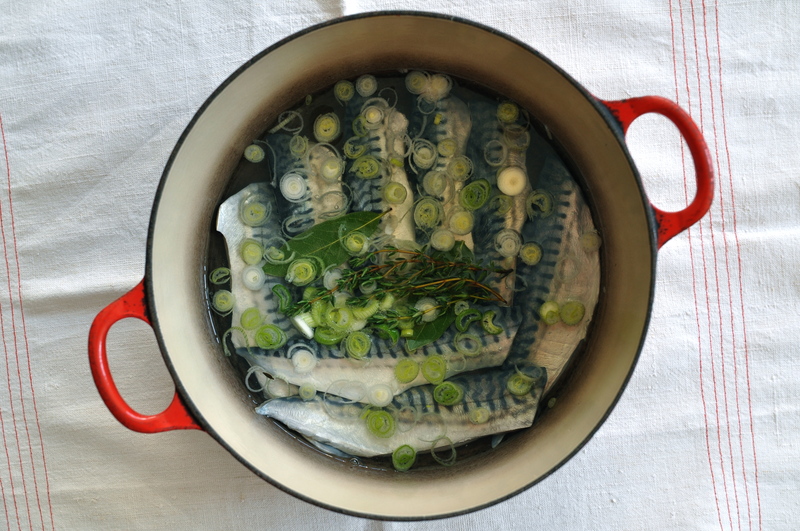 Place the mackerel fillets flat at the bottom of a pan, add the bay leaves, garlic, thyme, wine, and water. Bring to a gentle boil, simmer for 1 minute and remove from heat. As soon as the liquid is cool enough, take out the fillets and flake the fish, taking care to remove any remaining bones. Place the cooking liquid back onto the stove, cook for a few minutes until ireduced to a couple of tablespoons. In a medium bowl, combine the mackerel gently with the reduced liquid, the juice from 1/2 lemon (the other half for serving), and 3 Tbsps very good olive oil. Season with fleur de sel or sea salt and fresh ground pepper. Transfer to a serving bowl or jar and place in the refrigerator for at least an hour and up to 2 days. Serve with bread and butter, and a generous squeeze of lemon. This entry was posted on 15 May 2013 at 12:50 and is filed under Aperitif / Tapas, Fall, Fish / Seafood, Homemade and preserves, Spring, Summer, Winter. You can follow any responses to this entry through the RSS 2.0 feed. You can leave a response, or trackback from your own site. I was drawn to this dish when I saw your post on instagram- such a great idea! It is funny how for all our planning sometimes the best meals are the ones that come together in this way- effortlessly.